From left, Central Ohio SPJ 2016-17 President Doug Buchanan, board member Thomas Bradley and 2015-16 President Joe Meyer. 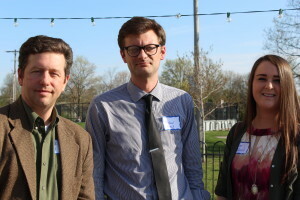 A celebration of local journalistic talent was staged Wednesday evening, April 20, by the Central Ohio Chapter of the Society of Professional Journalists. 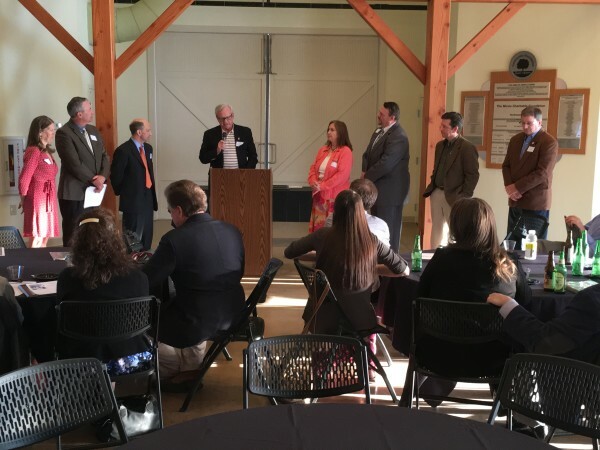 At the chapter’s 67th annual Founders’ Day, members and guests celebrated the program year just completed, recognized the top work by local journalists in 2015-16, saluted student journalists who show great promise, and paid tribute to the remarkable careers of several local icons of the profession. The chapter, founded in 1949, staged the event at the Amelita Mirolo Barn in Upper Arlington’s Sunny 95 Park, 4395 Carriage Hill Lane. 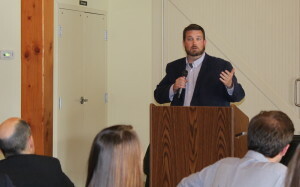 2016 First Amendment Award winner Lucas Sullivan, reporter for The Columbus Dispatch, addresses the crowd at the Central Ohio SPJ Founders Day celebration April 20, 2016, inside the Amelita Mirola Barn at Upper Arlingtons Sunny 95 Park. the Columbus Dispatch reporter whose coverage of the RedFlex red light camera scandal at City Hall kept readers fascinated over much of the past year. Its Appreciation Award went to Ben Marrison, who left the Dispatch in 2015 after a highly successful, 16-year run as its editor. Doug Buchanan, managing editor/digital for Columbus Business First, was honored tonight with the chapter’s Distinguished Service Award. The late Mike Bowersock, a great local TV reporter, also with Channel 4, who died tragically after a fall this spring. His wife Lisa accepted the award on Mike’s behalf. The final Chapter award of the evening was the Brick Wall Award. It is a dubious distinction presented to an individual or organization that, according to chapter members, did the most in the past year to block citizen access to public records and proceedings or otherwise violated the spirit of the First Amendment. This year our chapter voted to recognize the faculty at Ohio Wesylan University, who voted Monday April 18 to ban journalists from covering their faculty meetings. The meetings long have been opened and covered by local media and the student press at OWU. The OWU faculty voted 48-21 to ban all journalists, student or otherwise, from all faculty meetings April 18. The $2,000 Jacob A. Meckstroth Scholarship, named for a founding member of the chapter and Ohio State’s first journalism class, went to Ohio State’s Taylor Ferrell. Ohio State University Lantern Media Adviser and Central Ohio SPJ board member Spencer Hunt, left, and two winners of 2016 scholarships from SPJ: Faulkner Scholarship winner Michael Huson and Meckstroth Scholarship winner Taylor Ferrell. The Norman H. Dohn Scholarship, also for $2,000, is awarded by the chapter each year to a student who is an SPJ member at Ohio University. This year’s Dohn Scholarship went to Danielle Young, a sophomore in OU’s E.W. Scripps School of Journalism. The James W. Faulkner Scholarship is named in memory of James W. Faulkner, the Statehouse correspondent for The Cincinnati Enquirer, the founder of the Ohio Legislative Correspondents Association and the dean of political writers during his lifetime. 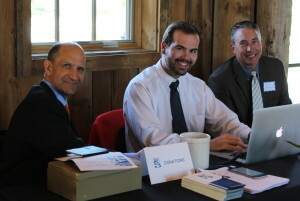 This year’s winners of $1,850 each are Michael Huson, of Ohio State University and James Steinbauer of Miami University. Michael serves as campus editor for The Lantern, and James serves as editor of the Miami Student. The Marty Award is named in memory of the late Martin L. Rozenman, a former Central Ohio SPJ chapter board member, editor at Suburban News Publications and Columbus Dispatch reporter. 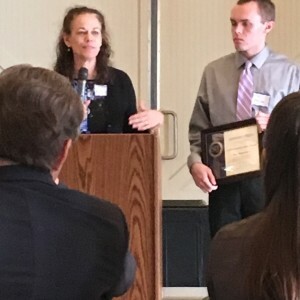 The Martys high school journalism award program is run and funded by ThisWeek Community News and the Dispatch Magazines, and sponsored by the Central Ohio SPJ. Past Central Ohio SPJ board member Dave Richter, center, administers the oath of office to incoming 2016-17 chapter officers and those beginning new three-year terms on the board, from left, Sarah Mills Bacha, Joe Meyer, Doug Buchanan, Mary Ann Edwards, Bruce Cadwallader, Spencer Hunt and Kevin Smith. First Vice President (programming): Sarah Mills Bacha, SMB Communications Ltd.
Chapter Board of Directors members being sworn in to new three-year terms were: Doug Buchanan, Columbus Business First; Spencer Hunt, Student Media Director, The Lantern at The Ohio State University, and; Kevin Z. Smith, Kiplinger Program in Public Affairs Journalism, The Ohio State University. The Founders’ Day 2016 ceremony was emceed by Central Ohio SPJ board member Karen Kasler of Ohio Public Media. 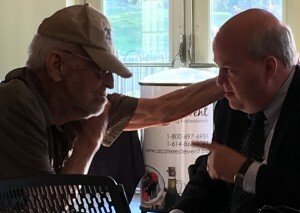 Lifetime Achievement Award winner Tom Borgerding accepts his award April 20. 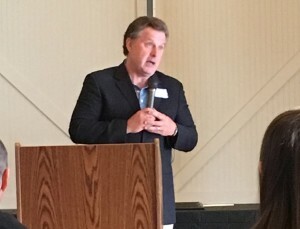 Lisa Bowersock and Tom Bowersock accept the Lifetime Achievement Award for their late husband and father, WCMH-TV reporter Mike Bowersock, at the Central Ohio SPJ Founders Day celebration April 20. 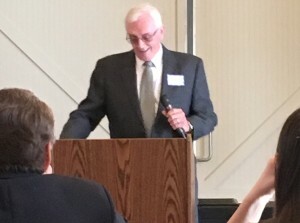 Longtime WCHM-TV news anchor Cabot Rea accepts his Lifetime Achievement Award from the Central Ohio SPJ Wednesday evening, April 20. 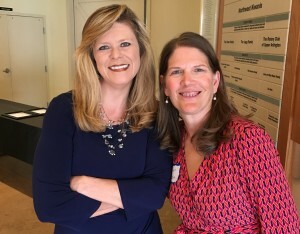 Central Ohio SPJ board member Karen Kasler, left, who emceed the Founders Day event April 20, with chapter Vice President Sarah Mills Bacha.